Measuring your baby's temperature is not complicated but you need a safe and accurate way to do it. And you need the right method in the right situation: sometimes quick and easy is fine, sometimes you need really precise readings. I recommend you get a good plain digital thermometer at the very least. They are not expensive at all and a basic item in your home pharmacy anyways. If you only have this, you're fine really. Then consider whether you add an easy no-fuss thermometer to that. Both forehead and ear thermometers do this. Very (!) 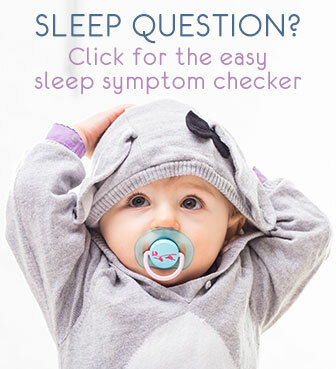 quickly and without disturbing or even waking your child, you get a good indication of your baby's body temperature - fever or not. 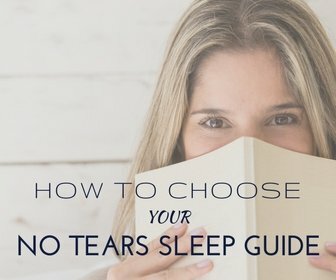 Let's discuss each type in a bit more detail. Con: Takes a while to measure, cannot be done correctly while baby sleeps. With this type you can measure under tongue, under arm or rectally. Either way, measuring baby temperature like this can be a bit of a fuss but you get reliable temperature readings. And sometimes you simply need that: for example to monitor fever during the critical phase an illness or to help decide whether to go see the doctor/ER or not. According to pediatricians, a rectal measurement is the only accurate one for under 3 years old. As long as your baby does not mind too much, it is actually not difficult to do. You just need her to lie down still for a little while ... When you make it a quiet cozy moment with some gentle distraction for your little one, that usually works well. I remember not feeling comfortable in the very beginning, to actually insert a thermometer ... now I know it's not that bad, you just need a well-suited one that is absolutely safe for babies. The Vicks Baby Rectal Thermometer is perfect for this: it's easy to use, safe thanks to its short tip (no risk of inserting too deeply so no injury risk). It is designed for children up to 3 years old, and you can start using it from newborn. Tip: wet the tip with water or dip it in nappy cream for easier and pain-free insertion. Until which age you will be able to do this rectal measurement will depend highly on how your child reacts. Stop when she's absolutely no longer comfortable with it. As soon as she's 3-5 years old, you will measure under arm (axillary) or under tongue (oral measurement) more easily - and more reliably than when younger. Measuring under the arm (axillary) is the easiest alternative. Only slightly less accurate in toddlers and up, it's not so reliable in young babies: it is difficult to place it correctly under baby's arm and to hold it there for long enough. If needed, do a couple of test measurements under arm and compare them with a rectal measurement. This will help you get good feel for the numbers you see and the accuracy. Remember that under arm will consistently give a lower result: most manufacturers list in their product manual how much degrees to add. 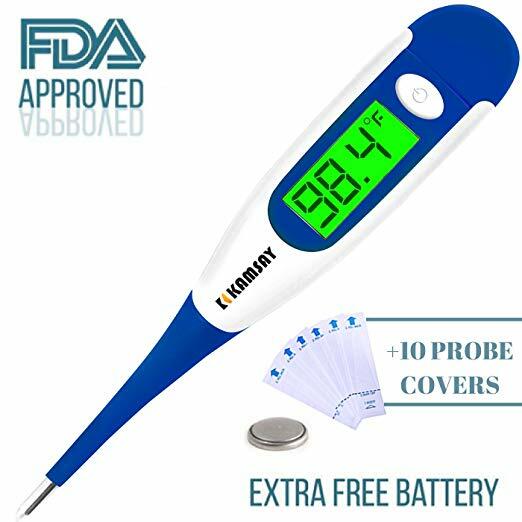 A good plain digital thermometer like the Kamsay 10 second Read is safe to use said to be safe rectally for baby, but you will be able to use it reliably under arm or tongue later on. I like its flexible tip. There are also digital pacifier thermometers for young babies. Easy but not very reliable and not always practical (especially if your baby is not used to a dummy, or refuses to keep it in for long enough). These types of thermometers give you baby's temperature in mere seconds without disturbing her in any way. A simple forehead swipe or insertion in the ear is all it takes. See my detailed reviews for measuring baby temperature with ear and temporal thermometers for more info. Don't underestimate your own built-in thermometer ... a soft kiss on the forehead tells most moms and dads very quickly if there's some temperature happening, or no fever at all. Not precise (we always carry our own body temperature) but very valuable for on-the-spot monitoring. Very young babies are not able to regulate their body temperature well. At the same time over-heating is dangerous. That's why it is important to monitor her temperature well, even when there is no illness of fever. Touching the back of her neck with a couple of fingers is one method many of us use. If all is well, that feels "just right": not sweaty, not hot and not icy. If the back of her neck feels really warm and moist, your baby is probably too hot (not necessarily fever). Start with removing a layer of clothing or covers and monitor closely. 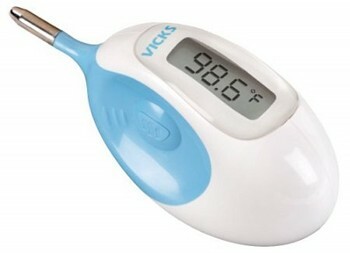 Do measure baby's temperature with a digital thermometer as soon as you can. Important! Remember that these instinctive readings are just that: a good first impression. High temperature and fever can be fatal in young babies so always complement with a digital thermometer and consult a doctor when you find or suspect a temperature.